Borg Drone: The Borg Drone is a bulky zombie-like figure with an ominously vacuous expression. His chassis is more elaborate than the other two, scalloped armor plating overlaps columns of intermingling circuitry; the Borg Drone’s right arm is weaponized; the drone’s face is partially obscured by a mechanical scope, and the back of his skull is festooned with thick black hoses. Seven of Nine (Borg Form): Seven of Nine’s grimly pallid countenance is moderately contradicted by the voluptuousness with which she occupies her form-fitting sculptured chassis. Her face is partially obscured by a mechanical scope, the back of her skull festooned with thick black hoses. Assimilated Starfleet Officer: From Star Trek: First Contact. 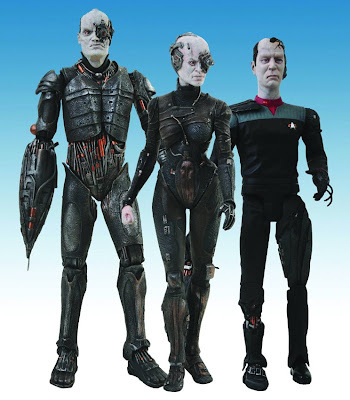 Seven of Nine (Brown Voyager Uniform): is a Previews exclusive sclupted by Jerry Macaluso. It will also includes a piece of the electronic "Borg Alcove" to build your own figure-sized display!